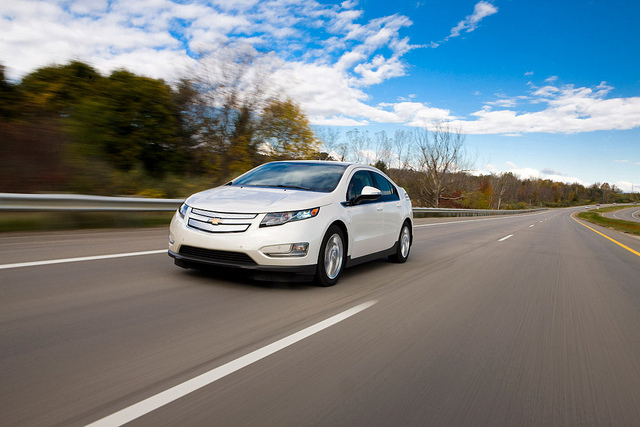 What’s New for the 2015 Chevy Volt? With a D2XX-based Chevrolet Volt supposedly just one or two years away from release, the first-generation Chevy Volt is getting close to the end of its model cycle. So there is nothing revolutionary coming to the 2015 edition of the Volt, just one deletion and three additions. Specifically, the 2015 Volt is scrapping the White Diamond Tricoat exterior color and replacing it with Iridescent Pearl Tricoat. New tech updates include an optional Navigation and Bose Premium Audio bundle package, as well as an available OnStar 4G LTE Wi-Fi hotspot. This 2015 Volt has the same familiar low roof, high tail, textured front grille, and stout, rounded body–all in the interest of increased aerodynamics. Although everything about the Volt is focused on elevating functionality over form, this is not an unattractive vehicle, and many customers will probably find the car’s design more aesthetically pleasing than the look of competing hatchback hybrids. The 2015 Volt runs on a 149-horsepower electric motor that can carry the car for an estimated 38 miles before running out of juice and switching over to the Volt’s 1.4-liter four-cylinder range-extending engine, which then powers the 54-kW generator that produces the electricity needed for the electric motor to keep running. Drivers that drive less than 40 miles a day rarely need to switch over to the gasoline engine and often go months without refueling. Although you shouldn’t take it drag racing (top speed is electronically limited to 100 mph), the Volt’s electric motors deliver smooth and seamless acceleration, going from 0 to 60 in 9 seconds, and does so while making very little noise. If you are interested in a more detailed (and literal) dissection of the Volt’s powertrain, you should check out this video. Chevy also recommends the use of premium gas, which is something to consider if you are primarily interested in the Volt because you want to pay less at the pump. However, Volt owners are reportedly driving an average of 900 miles between gas station stops, so the indulgence may be worth it. The Volt looks even better from inside, with a cool, modern look and dashboard configuration. A 7-inch reconfigurable color LCD screen located in front of the steering wheel displays both basic and more detailed information, while a 7-inch color touchscreen located in the center console controls Chevy MyLink radio (and available Navigation and satellite radio). A 6-speaker audio system is standard, while a Premium Bose sound system is optional. The 2015 Volt comes standard with 8 air bags, five years of OnStar service, and the LATCH (Lower Anchors and Tethers for CHildren) system for child safety seats. Optional features include Front Park Assist, Rear Park Assist, Lane Departure Warning, rear vision camera, and Forward Collision Alert.